Researchers led by Dr. Knut Woltjen report a new gene editing method that can modify a single DNA base in the human genome with absolute precision. The technique, which is described in Nature Communications, is unique in that it guides the cell's own repair mechanisms by design, providing pairs of genetically matched cells for studying disease-related mutations. Single mutations in DNA, known as single nucleotide polymorphisms—or SNPs for short—are the most common type of variation in the human genome. More than 10 million SNPs are known, many of which are associated with ailments such as Alzheimer's, heart disease and diabetes. In order to understand the role of SNPs in hereditary disease, scientists at Kyoto University's Center for iPS cell Research and Application (CiRA) create induced pluripotent stem cells from patient donors. iPS cells retain the genetic makeup of the donor and can be converted into any cell type in the body. In this way, cells from tissues such as the brain, heart or pancreas can be created and observed in the laboratory, enabling safe testing for new disease treatments before starting clinical trials. Proving that a SNP causes disease requires very strict comparisons to genetically matched, or isogenic, iPS cells. The ideal cells are what the researchers describe as isogenic "twins," cells whose genomes differ only by one SNP. However, Dr. Shin-Il Kim, co-first author on the study, says that creating these twins is not trivial. "Usually, we need to add a gene for antibiotic resistance along with the SNP to overcome low efficiency. 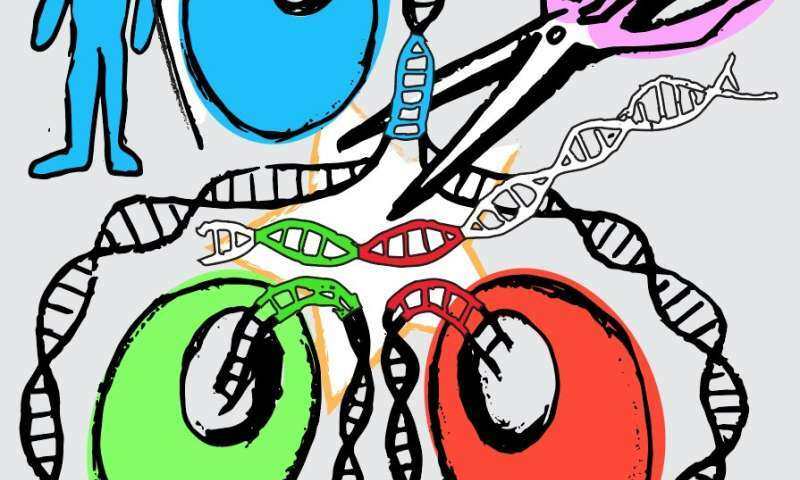 Since that adds another change to the genome, we also need a way to remove it." To create isogenic twins, the Woltjen laboratory has developed new genome editing technology that inserts an SNP modification along with a fluorescent reporter gene, which acts as a signal to detect modified cells. They also engineered a short duplicated DNA sequence, known as a microhomology, on the left and right sides of the reporter gene, and unique target sites for CRISPR, an enzyme that cuts DNA. These features allowed the researchers to exploit an endogenous DNA repair system in the cell called microhomology-mediated end joining (MMEJ) in order to precisely remove the reporter gene. MMEJ removes the fluorescent reporter gene, leaving only the modified SNP behind. By arranging the mutant SNP in one microhomology and the normal SNP in the other, the method efficiently generates isogenic twins. CiRA Associate Professor Dr. Knut Woltjen, called the new gene editing method MhAX, or Microhomology-Assisted eXcision. Woltjen's inspiration came from observing naturally occurring MMEJ repair in response to DNA damage. "To make MhAX work, we duplicate DNA sequences which are already present in the genome. We then let the cells resolve this duplication. At the same time, the cells decide which SNPs will remain after repair," he says. "One experiment results in the full spectrum of possible SNP genotypes." In collaboration with Dr. Takashi Yamamoto at Hiroshima University, and Dr. Tomoyoshi Soga of Keio University, the Woltjen lab used MhAX to create SNPs in the HPRT and APRT genes, mutations that are associated with gout and kidney disease, respectively. Biochemical analyses showed cells with the HPRT mutant SNP had altered metabolism similar to patients, while the isogenic twin control cells, derived in the same experiment, were normal. The APRT*J mutation, often found in a population of Japanese patients with acute kidney failure, demonstrated the high efficiency of MhAX, as both gene copies (one from the mother and one from the father) required gene editing to study the mutation's effects. Woltjen's lab has already begun applying their method to the creation and correction of SNPs in genes associated with other diseases. Collaborating with researchers in Japan and Canada, they are investigating the genetic cause of severe diabetes in juvenile patients. Diabetes clinical trials using embryonic stem cells are currently underway, but chronic immune suppression is required. Gene correction of the patient's own iPS cells could lead to a source of healthy insulin-producing pancreatic cells with a reduced chance of rejection following transplantation. "Our goal is to generate gene editing technologies which improve our understanding of disease mechanisms, and ultimately lead to therapies," said Woltjen, "We're confident that MhAX will have broad applicability in current human disease research, and beyond." 1 SNP MAY Fix Another SNP, Who Knows ! So, Keep Adding SNPs in Mice until it is killed, Disease gets fixed etc., Of course, COLLECT The Data for Future, Meanwhile. Cannot do it in a Foolish manner, Certainly yes. So, Do it Diligently; This is Another Path to study Nature. REMEMBER, We are doing it all in 1-Celled Mouse Embryos! If some info. is gleaned, Try to repeat it in guinea pigs, sheep etc., Adage goes that ROME was Not Built in 1 Day !